Why not plan an amazing Branson get-a-way just to relax? The scenic relaxing setting of the Welk Resort. At first, it might seem like an oxymoron to even suggest that one relax amid all the entertainment, excitement, and fun that Branson offers, but it’s not! What’s wrong with planning a get-a-way to Branson just to relax? Absolutely nothing! A relaxing get-a-way to Branson doesn’t mean that you must miss out on any of what Branson offers. It just means that, from the selection of lodging, to your activities and entertainment you plan for “relaxation.” That would mean different thing for families with children and couples coming alone. Here’s just one idea for a relaxing “couples get-a-way” to Branson. It all starts with a hotel or lodging accommodation that will provide the opportunity for relaxation in terms of location, accommodations, and amenities. The Welk Resort, is one such resort. 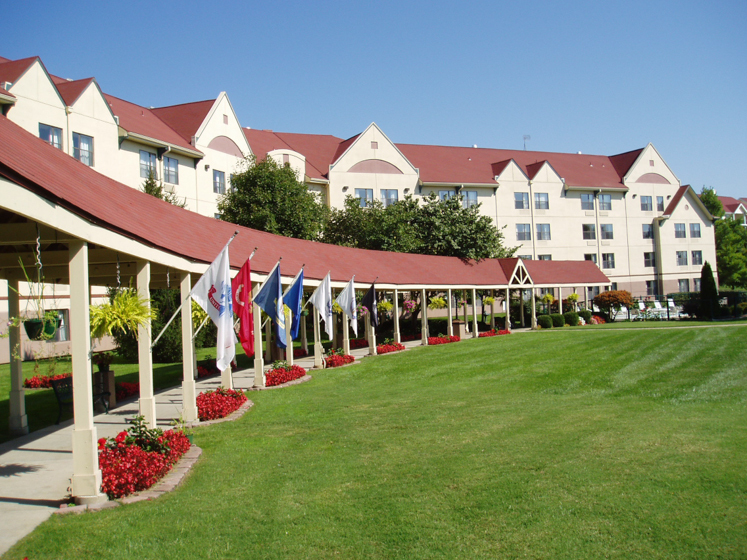 Its location provides a rustic flavored experience, surrounded by luxury and convenience, where you can experience the outdoors and beauty of the Ozarks away from all the traffic and bustle of the Branson Strip. It’s totally relaxing, yet ideally and uniquely located to provide access to everything Branson offers. The hotel just underwent a total multimillion dollar renovation of its lobby, common areas, corridors, and all 159 guest rooms and baths in 2013 making it one of the “newest” hotels in Branson. The relaxing colors and textures of each of the renovated rooms reflects the casual, warm and friendly culture of the Ozarks. Each room contains features such as granite vanities, a work space with an ergonomic desk chair, wall-mounted AC controls, desk lamps with easy reach dual outlets, mini-fridge, Welk Signature Ecology bath amenities, 32” LCD widescreen TVs, free wireless internet, Seattle’s Best single cup coffee system and Starbucks’ Tazo Teas, and everything else needed for a completely enjoyable and relaxing experience. The opportunities for relaxation, on property, include a fitness room, a game room, gift shop, a 10,000-square foot “Splash-A-Torium,” mini-golf course, and an outdoor patio overlooking the resort’s award-winning, landscaped gardens. Off property, the Pointe Royale Golf Club, miles of hiking and biking trails, some of the finest trout fishing anywhere, scenic overlooks, and Table Rock Lake are all less than ten minutes away. Whether breakfast, lunch or dinner, the resort’s “Stage Door Restaurant” serves affordable American favorites in a casual, relaxing atmosphere. Service is available from the menu or their incredible buffet! Easy access to many of Branson’s most popular restaurants are less than ten minutes away. One of Branson’s hottest new shows, the “Million Dollar Quartet” is just steps away. It doesn’t get much more relaxing than being able to walk a few steps into the 2,000 seat Welk Resort Theatre for some of the finest live entertainment available in Branson. This state of the art theatre is the home of one of Branson’s most popular shows, the smash hit Million Dollar Quartet. 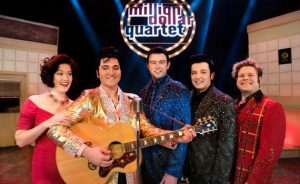 It’s an award-winning musical, based on a one-time impromptu jam session of four young recording artists who were soon to become legends; Carl Perkins, Elvis Presley, Johnny Cash, and Jerry Lee Lewis. It also hosts other national touring stars such as Daniel O’Donnell, Charlie Pride, Jay Leno, and others. The famed Branson Strip, and many of Branson’s most popular shows, is less than ten minutes away. For more information on a relaxing stay at the Welk Resort or the fabulous Million Dollar Quartet, please contact the Branson Tourism Center, one of Branson’s largest and most respected vacation planning services and sellers of over 5 million Branson show and attraction tickets by calling 1-800-785-1550 or through their website, www.BransonTourismCenter.com. This entry was posted in Branson Lodging, Branson Shows, Featured on August 21, 2017 by Gary Groman.